Liechtenstein has, since the end of the Second World War experienced an economic and cultural development unsurpassed, in relation to the size of the country, by any other western nation. From being an agrarian state, Liechtenstein has developed into being one of the world's most highly industrialised countries. Apart from efficient industries one also finds numerous trades and well-organized services in Liechtenstein. 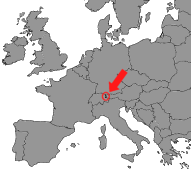 Liechtenstein consists of 11 municipal areas. The capital Vaduz has about 5200 inhabitants and is the place of residence of the Sovereign Family and the seat of the government. The form of government in the Principality of Liechtenstein is that of a male line monarchy. According to the constitution of 5th October 1921, the governmental power is shared between the Prince and the people. The Liechtenstein Parliament is elected by secret ballot. It consists of 25 members. The term of office is four years. The main duty of the parliament is to implement the law in accordance with the constitution, and to propose the formation of the government to the Prince. The government is made up of the head of government, a deputy and three ministers. Their term of office also lasts four years. The ruling of the country is the duty of the government which is responsible to the Prince and the parliament. The people of Liechtenstein can directly influence the law through the System of right of initiative and referendum.